As the rays of sunlight shone mostly over him, the esteemed Pastor was behind the pit, dutifully manning the meat like a true saint sent on a mission from God. The sweet-smelling smoke didn’t seem to bother him at all as the wind picked up a little when he turned over the rack of ribs with those steely tongs. 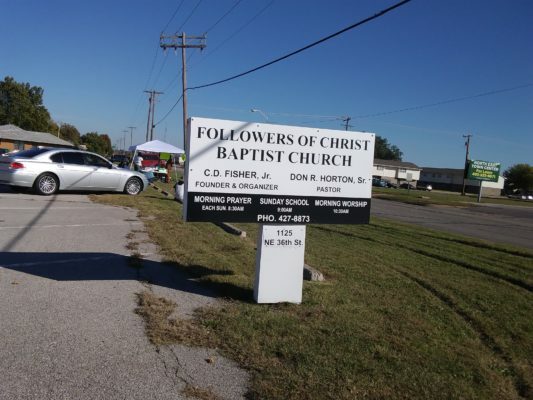 Gathered just a few feet from the busy road, the large smoke-pit and a couple of tables full of sides, plates and other ephemera was tied-down out in front of the Followers of Christ Baptist Church, 1125 NE 36th Street. The Pastor and his congregation had been tending to the meat all afternoon, feeding weary drivers with some of their heavenly praise and their heavenly barbeque. That’s how I found them, waving to cars and looking like they were having a joyous time of spiritual fulfillingness together. 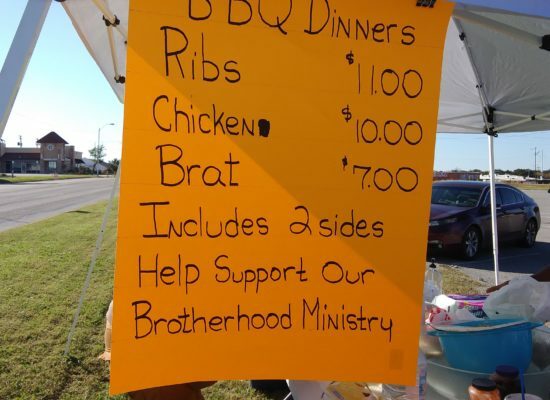 While there are always a few rib joints that I tend to side with in any argument—the much-loved Leo’s Barbeque is just a few blocks away—the truth is the best BBQ of any sort always seems to come from these little church fundraisers, just like this. It reminds me of when I was just a kid and my peace officer father would patrol typically Baptist churches, watching out for big-time trouble on a small-town Sunday; I would stay behind and fill my plate, putting a hurting on fried fish, barbeque and, really, just about anything else off that smoking grill. That’s how you gain a flock, shepherds in need of sheep. 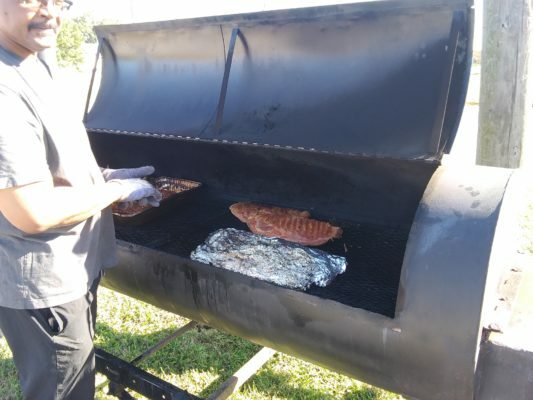 Raising money for their ministry efforts, today the Followers of Christ were offering a helping of brats, chicken or ribs, all just sweating to well-done perfection in that smoker. 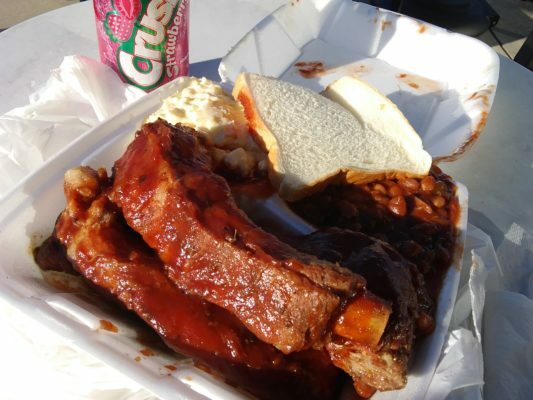 Without questioning, I paid my $11 for a helping of ribs, which came with some baked beans right off the grill, handmade potato salad from a big aluminum pan, a piece of white bread and, to cool you down right proper, a cold Strawberry Crush. As I stood there, waiting for my eats, the kindness was even warmer than the flames from the pit; the Pastor seemed genuinely happy that I stopped, taking off his cooking mitt to shake my hand. An older lady asked me if I was into OU football—here it was, a big game, and I was nowhere near a television—to which I replied that I was not a big fan of football, but I am fan of barbeque, to which she laughed and told me I was in the right place. As my Styrofoam container was spilling over with an abundance of the aforementioned beans and potato salad, the Pastor sliced thickly my ribs, making sure there was plenty of meat with just a little bit of flavorful fat on there; the meat and sides caused the box to mildly explode, the sauce that was drizzled on top, by request, spilling out the corner. Looking at it though, it’s everything that we were generously promised in the afterlife, deliciously smoked in the devoutly here and now. I said my thankful goodbyes to the genteel congregation of the Followers of Christ and drove to a empty city park to sample this great bounty from the Lord above; the potato salad was a refreshing scoop of soul-aching tenaciousness, but those baked beans were a sweet but spicy source of natural heat, so much so I had to take a couple of sips of that dripping sweet Strawberry Crush to cool me back down a little. But, when it came to the ribs, it felt like a moment of pure divinity as I realized this was the reason—or at least one of the few reasons—why we were created to walk the Earth and have dominion over the beasts; every rib was so plump and porky, compete with a heavy coating of searing homemade sauce over the top, that it was spiritually enough to make you, me and everyone we know jump up and holler “Hallelujah!”. While they may not be there next week, or even the week after next, try to keep a keen eye when cruising up and down NE 36th; if ever you see the Pastor out front of the Followers of Christ Baptist Church, working that smoky pit in the afternoon sun, dig around for eleven or so bucks and help out the ministry while you help out your BBQ-loving soul. Then, and only then, will you know what pure Heaven tastes like. Cómpralo ya! Next post Uh oh. Channel 5 has a campaign ad “Truth Checker,” too. Divine ribs you say!? You don’t have to tell this guy twice! I’m there. But why should that calling be limited only to Catholics? It’s always good to see Christians of any tradition catching the true spirit of Christianity – as opposed to obsessing over who is sleeping with whom, and/or observing carefully who is using which bathroom. A generous helping of delicious eats in exchange for a modest donation? What could be more Christlike than that? If a passerby had lacked the modest donation, I am confident that the Pastor and his flock happily would have fed the hungry soul for free. Because what would Jesus do? 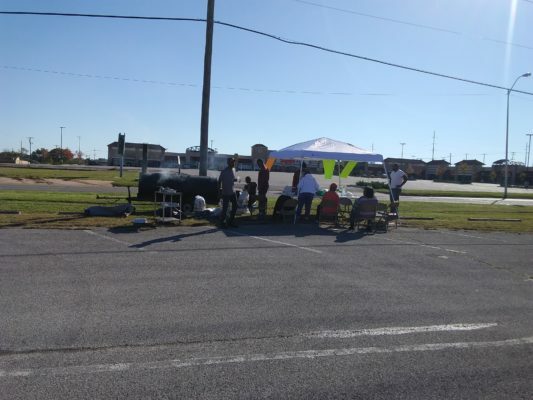 The fine folks at the Followers of Christ Baptist Church have earned my lasting respect, even if it had to be vicariously by way of Louis’ mouth-watering review of their yummy roadside example of Christianity in action. Memories. Memories. The best barbecue in Texas is to be found at the New Zion Missionary Baptist Church on Montgomery Rd. /FM 1374 Exit off I-45 in Huntsville. If you get chicken one day and ribs or sausage the next, it’s not really eating the same thing every day. And, if you go inside for the all-you-can-eat platter, you’re a lightweight if you don’t finish it off with some sweet potato pie.